The R formula syntax is wonderfully condensed yet instructive. Python has basically given up coming up with its own syntax and now just use the patsy module to use R syntax in Python. It got a great reception and gathered more than half a million views on twitter within the first day. On the bright side, this shows that people care about understanding statistics, and communicating it effectively. On the flip side, it may also reflect the fact that too many statistics courses consist of the rote-learning-rules-of-thumb-and-decision-trees which I seek to combat. I have also been extremely pleased that the community has joined in to improve it even further via the GitHub repository. It has been refined a great deal over the last week as a result. Follow the repository on GitHub if you want to stay up to date. Even better, raise an issue or submit a pull request. That would make me so happy! Much of what I demonstrate in that post has been known, published, and taught here and there for quite a while. I think that my main contribution was to lower the bar for understanding it, believing it, and teaching it. Update my notebook on Bayes Factors and put it on GitHub. Finish a notebook on Utility Theory in time for the Bayes@Lund conference, where I will be presenting it. Do a new notebook on Repeated Measures as mixed models, including RM-ANOVA, Split-plot ANOVA, McNemar, and Friedman. In some way extending the post/cheat sheet (or making a new one) on how three statistical assumptions play out in all of these models. I am also contemplating writing a book. 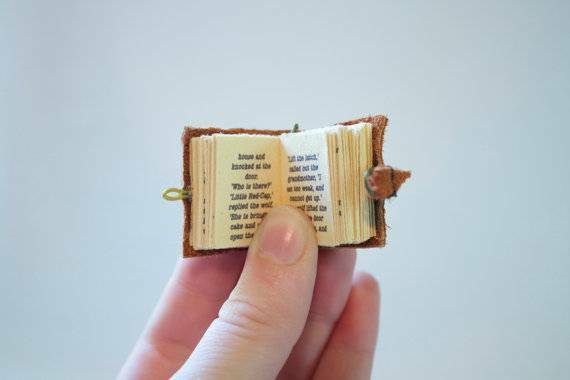 There are a lot of good books out there already, and I don’t intend to compete with them. Rather, the book I have in mind should be mind-blowingly short and applied, covering 90% of a traditional textbook, including model checks and Bayesian inference, in 1/20th of the space. A third of those pages would have to be code examples and paper-and-pencil tasks so that it’s easily transferable to the real-world problems people encounter. Other than everything-is-linear approach, there are a few other general-purpose tricks that can be pulled off to radically simplify statistical modeling. Having this all in a condensed yet accessible format would make it easier for the reader to get the larger picture. If you use SPSS in your business or research, move to R now rather than later. Do not ask for SPSS competences in job postings. You will scare away the good candidates. We are doing students a disservice by teaching SPSS. Switch to JASP for simple one-off analyses and R for complex or repeated analyses. Rstudio Desktop is a highly recommended interface to R.
The numbers have been clear for a number of years now that SPSS was on the decline. It was very clearly exposed by Robert A. Muenchen in a comprehensive 2016-analysis of the use of data science software. Robert looked at everything from job postings to online queries to academic citations. 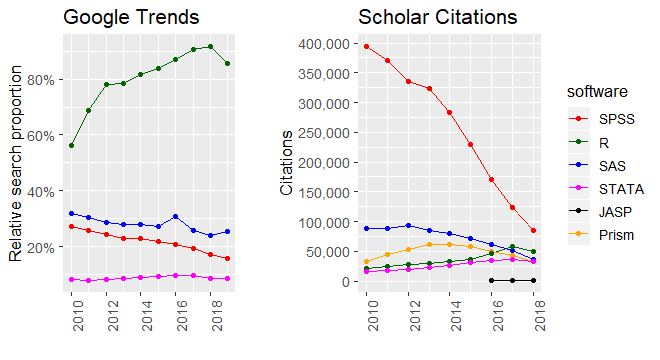 I have updated two of these analyses to include data from 2017 and 2018: Google Search Trends and citations in the academic literature. Here, we need to look at the trends rather than the absolute values for reasons I explain in the end of this post. Although R took a small dip in 2018, it is clear that it is getting traction. It is a good guess that R and SPSS will par citation-wise in 2019 and that R will have overtaken SPSS by 2020. Let’s see why and what it means. A few years ago, I wrote a blog about how a new GUI program, JASP, gets most things right, and how that exposing SPSS’s many shortcomings. SPSS simply feels old and unmaintained. Users have been screaming for simple statistics like Cohen’s d, confidence intervals on correlation coefficients, meta-analysis, etc., which has been a mandatory part of many major publication guidelines since 2000. This is not just some science formalia – these statistics are highly informative for industry as well. Despite repeated requests, SPSS has not implemented these, or many other standard statistical methods. SPSS now plans to change the GUI to match what JASP did four years ago. SPSS simply feels old and unmaintained. In addition, both industry and science now require greater reproducibility, transparency, and interaction with data. If you have ever tried using SPSS, you will know that it is fundamentally not fit for these. R saves you time. First, it is free, saving you (and your collaborators) time by not having to handle licensing and asking for budget approvals. As a statistician, most of the time is spent pre-processing data before doing the statistics. Since the advent of tidyr in 2014, this has become incredibly easy to do. Perhaps more importantly, it has become much easier to read the code, which facilitates seamless collaboration and empowers you to learn much quicker from examples online. Pre-processing is often a non-linear process where you go back and forth. R is like editing a recipe in a text editor, and SPSS is like having to dictate the whole recipe on tape every time time you add a pinch of salt. JASP, by the way, is much closer to the recipe than the dictaphone. [Concerning pre-processing,] R is like editing a recipe in a text editor, and SPSS is like having to dictate the whole recipe on tape every time you add a pinch of salt. When researchers develop novel analysis methods, they will often publish them in user-friendly R-packages even before they publish the accompanying academic paper. For the most part, if you can think if it, it exists and is only one “install.package()” away. Not stumbling into software limitations saves you time. Perhaps counter-intuitively, it turns out that students like programming (once they get started!) as it helps them better grasp what they are doing to the data than a point-and-click interface. In R, you can load data, pre-process it, and do a mixed model in just five relatively self-explanatory lines of code. It would take 20+ clicks in SPSS. If you want to do it for multiple datasets, you have to go through all that SPSS-clicking again (remember the dictaphone). It is really easy to miss a click and unknowingly get wrong results. Less repetition and debugging means more time saved in R.
After all, statistics is about the interaction and processing of variables. The same is true of programming. Therefore, programming requires less abstraction than graphical user interfaces. Programming is, of course, overkill for one-off analyses with little pre-processing. JASP, and its sibling Jamovi, are free graphical user interfaces to R that fills in this space. Statistics is about the interaction and processing of variables. The same is true of programming. Therefore, programming requires less abstraction than graphical user interfaces. Consider SPSS a liability. Either weakly through taking more person-hours to use. Or strongly, through the increased risk of hard-to-detect errors. Ask for R competences in job postings. If you ask for SPSS competences, you will select for applicants who are not up to date and filter out those who are, because they will want to avoid SPSS. We should also stop teaching SPSS. Students spend a disproportionally large amount of learning the interface rather than learning the statistics. When they graduate, the cost of SPSS will incentivize them to avoid stats. JASP may be a good start for undergraduates because of the very shallow learning curve and sensible defaults. Then switch to R in the next semester to further empower the students. I have a few ideas (and a cheat sheet!) about how to improve stats teaching which would be easier in R.
The Google Trend values for R are likely inflated by the fact that R has a more technical audience which uses the internet more than SPSS users, who do less advanced analyses based on books. As a reflection of actual usage, we should probably just look at the trends which show that R is on the increase and SPSS is on the decline. The absolute citation numbers in the graph is a bit misleading since it goes down while we know that the annual publication volume is increasing exponentially. It seems that we simply cite the analysis software less frequently than we used to. However, the relative popularity of software packages is still valid and R is close to overtaking SPSS. To collect these data, I wrote a Google Scholar Scraper here (in R, of course) and I have posted the datasets here. I used Robert Muenchen’s search terms which I found valid. As a side effect, you can use this scraper to collect time-trends in all Google Scholar searches. I just happened to search for statistical packages. Note that you need to update the full dataset to compare citations by year. For example, Robert found ~300.000 SPSS citations in 2011 where I found ~375.000 using the same search string. Google Scholar improves and more publications are retrospectively put online. Update (Aug 7th, 2018): after reading this preprint by Liddel & Krusche (2017), I am convinced that it would be even better to analyzeLikert scales is using ordered-probit models. This is still a parametric model; just with non-metric intervals between response category thresholds. What I write below still holds for the non-parametric vs. parametric discussion. Whether to use parametric or non-parametric analyses for questionnaires is a very common question from students. It is also an excellent question since there seem to be strong opinions on both sides and that should make you search for deeper answers. It is the difference between modeling your data using parametric statistics (means and linear relationships, e.g., ANOVA, t-test, Pearson correlation, regression) or non-parametric statistics (medians and ranks, e.g., Friedman/Mann-Whitney/Wilcoxon/Spearman). Consider this 5-item response. What do you think better represents this respondent’s underlying attitude? The parametric mean (SD) or the non-parametric median? You would often draw similar conclusions from parametric and non-parametric analyses, at least in the context of Likert scales. For presenting data and effect sizes, always take a descriptive look at your data and see what best represents it. As it turns out, (parametric) means are usually fine for Likert scales, i.e., the mean of multiple Likert items. 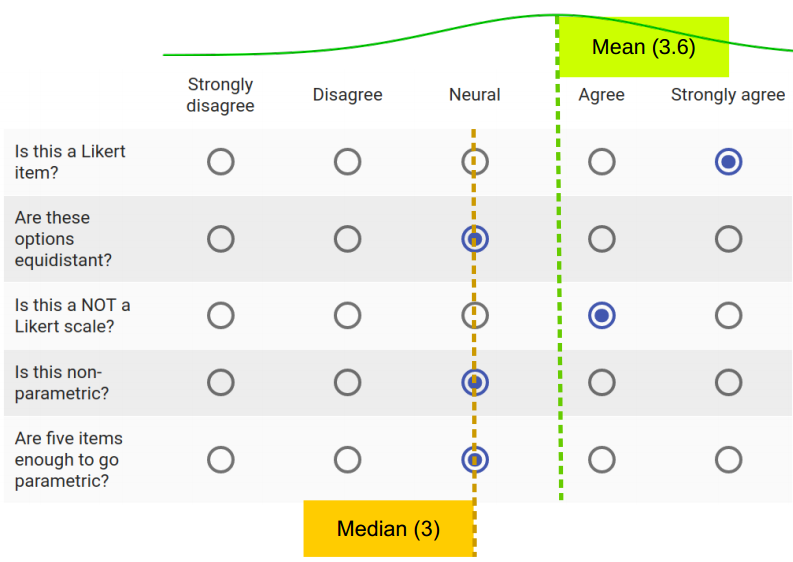 But (non-parametric) counts are often the correct level of analysis for Likert items, though this can be further reduced to the median if you have enough effective response options (i.e., 7 or more points which your respondens actually use). Due to measurement inaccuracy, interpreting single Likert items is often unallowably fragile, and no statistical tricks can undo that. So you should operationalize your hypotheses using scales rather than items as indeed all standardized questionnaires do. As you see from the above, this, in turn, means that your important statistical tests can be parametric. Because parametric inferences are much easier to interpret and allows for a wider range of analyses, it is not only an option but really a recommendation to use parametric statistics for Likert scales. I would personally add to this that you should not dismiss the ordinalist-intervalist debate since its exactly the lines of thought that we ought to have when we chose our statistical model, namely to what extent the numbers represent the mental phenomena we are investigating. Others (e.g., the censor) may be ordinalists, so make sure (as always) to justify your choice using empirical literature. This makes your conclusions accessible to the widest audience possible. I provide here a short reading guide to help you make those justifications. Students and newcomers are recommended to read the papers in the stated order to get a soft introduction. Readers more familiar with the topic can jump straight to Harpe (2015). I would say that Sullivan & Artino (2013) and Carifo & Perla (2008) gets you 75% of the way and Harpe (2015) gets you 95% of the way. Norman (2010) is included for its impact on the debate and because it presents the arguments slightly more statistically, but content-wise it adds little over and above Harpe (2015). Note that this is an extensive literature, including some papers leaning ordinalist. However, I have failed to find ordinalist-leaning papers that did not commit the error of either (1) a conflation of Likert items and Likert scales without empirical justification for doing so, or (2) extrapolating from analysis of single items to analysis of scales – again without empirical justification that this is reasonable. If I learn about a paper which empirically uncovered that parametric analyses of Likert scales are unforgivingly inaccurate, I would not hesitate to include it. However, I feel like all major arguments are represented and addressed in this list. A light read for novices which could serve as an introduction to Likert-scales understood statistically and the idea of using parametric analyses on Likert data. However, it is too superficial to constitute a justification for doing so. A very concise list of arguments on the statistical side of the intervalist-ordinalist debate, heavily favoring the intervalist side for most situations. As a side note, this is a continuation and summary of Carifio & Perla (2007), but while the fundamental arguments of that paper are strong, it is so poorly written that I do not include it in this reading guide. Maybe this is why they needed this 2008 paper. This paper introduces both the history, rating scale methodology, and empirically-based review of inferring ratio parameters (like means) from ordinal data (like Likert-items). 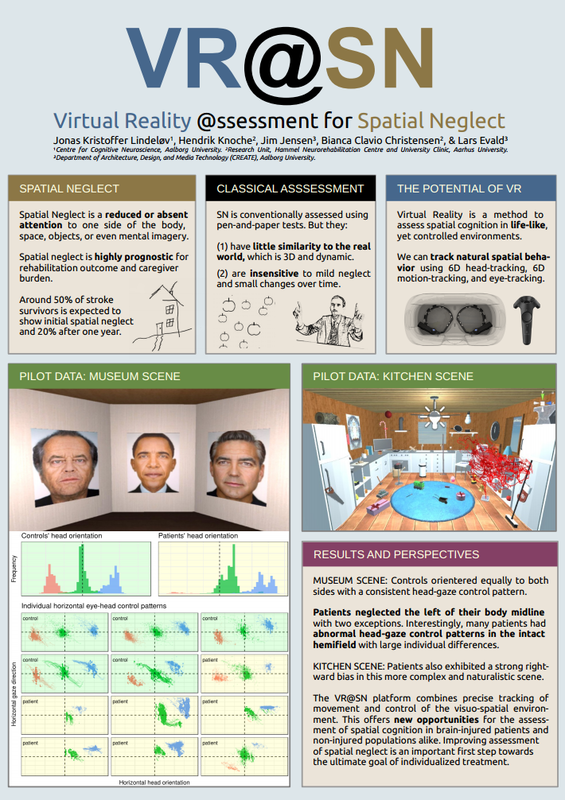 Here too, the conclusion is that parametric analyses are appropriate for most situations. Most importantly, Harpe presents practical recommendations and nuanced discussion of when it is appropriate to deviate from those recommendations. Also, it has one of the most extensive reference lists, pointing the reader to relevant sources of evidence. As a reading guide, you may skip straight to the title “statistical analysis issues” on page 839 while studying Figure 1 on your way. Even though this paper is very fluently written, do take note of the details too because the phrasing is quite accurate. This is the most cited paper on the topic, so I feel like I need to comment on it here since you are likely to encounter it. Recommendation-wise, it adds little new that Harpe (2015) did not cover. Some advantages of the paper are that it brings you to the nuts and bolts of the consequences of going parametric instead of non-parametric, e.g., by presenting some simulations and actual analyses. The paper is fun to read because Norman is clearly angry, but unfortunately, it also reads largely as a one-sided argument, so retain a bit of skepticism. For example, Norman simulates correlations on approximately linearly related variables and concludes that Spearman and Pearson correlations yield similar results. While this is a good approximation to many real-world phenomena, the correlation coefficients can differ around 0.1 when the variables are not linearly related (Pearson inaccurate) but still monotonically increasing/decreasing (Spearman accurate). This can change the label from “small” to “medium” cf. Cohen’s (1992) criteria which are (too) conventionally used. Many “non-parametric” analyses are actually parametric. If the paper used the mean Likert rating of multiple items, they are largely parametric, no matter if they do non-parametric tests of this mean. 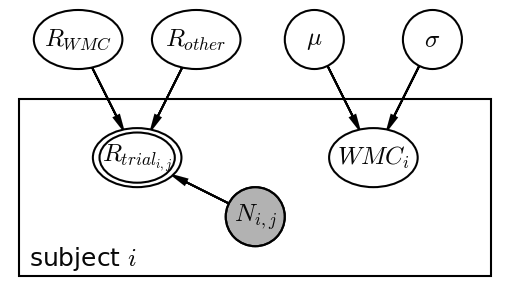 This is because taking the mean embodies the parametric assumption that the response options are equidistant, e.g., that the mean of “strongly disagree” and “neutral” is “disagree.” Similarly, if the paper used Cronbach’s alpha to assess reliability or unidimensionality, they are parametric since it’s a generalized Pearson correlation, i.e., modeling a continuous linear relationship between Likert items. The vast majority of the academic literature does this, including every single standardized questionnaire. A practical consensus is not a convincing defense of going parametric on Likert data, but it does indicate that it requires little to get to the level of current publication practices. Prediction of responses to single items must be ordinal. Predictions of responses should only yield actual response options. E.g., not 2.5 or 6 on a 5-point Likert scale. 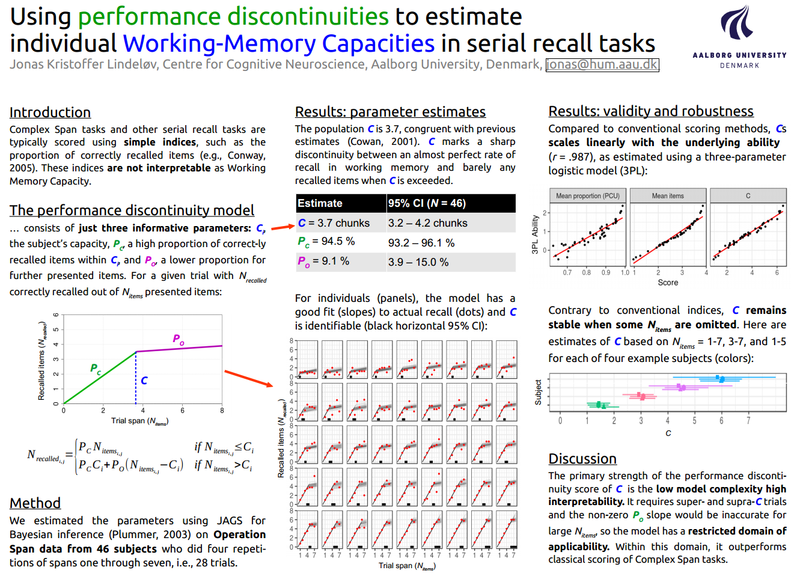 For scales or predictions across subjects (i.e., the mean of items) the parametric estimate will often be good enough. 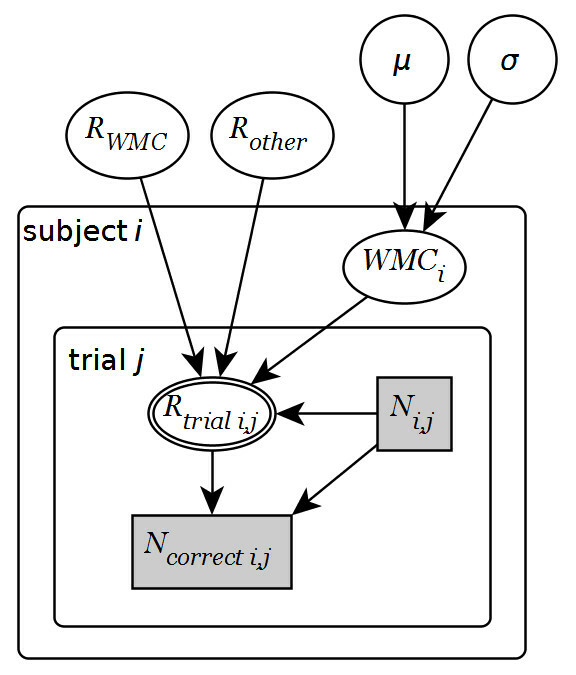 I have not found literature which has tried to predict responses on individual items by individual subjects, but if you were to do so, you would have to do some transformation of the inferred parametric estimates back into predicted discrete ordinal responses (e.g., probit transformation). Multilevel models are superior. Always beware when “manually” computing differences, means, analyzing subsets of data, etc. since you usually through away valuable data. Similarly in the context of Likert scales where you compute a mean. It is self-evident that the mean of 100 items would much better approximate the true underlying attitude of your respondent than the mean of 4 items. Yet, Mann-Whitney U or other analyses would not “know” this difference in certainty. Multilevel models would much better represent the data, seeing the response to particular items as samples of a more general attitude of the respondent (with a mean and a standard deviation) rather than pure measures. However, I have not presented or discussed multilevel solutions above, since the learning curve can be steep and the classical scales-as-means approach is accurate enough for most purposes.